Adventure through twelve lands and put everything back together. "What an enjoyable game! I needed something to sneak away to and unwind, and this was the perfect choice. There is no difficult story line to follow. Just matching pairs or triples. The mini games are also a nice distraction." The Clutter is back and it needs to be cleaned in Clutter II: He Said, She Said. Everything you loved about Clutter and more is included in this exciting sequel. There are more levels, more variations and more addictive puzzles than before. Everything is re-playable, even the mini games. Adventure through twelve new lands as you try to put everything back together again. The randomly generated puzzles will give you hours of new challenges and gameplay. Will you be able to clean up the Clutter? Not that I love clutter, in fact, I love clean. But in this case, Clutter is where it's at. 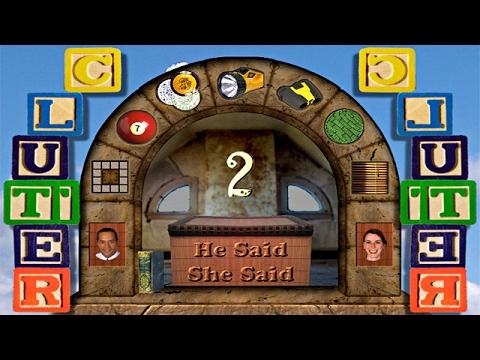 This game is original fun, and I love the He Said, She Said tidbits and trivia. So unique. This is one of those games that can be played over and over and not replay the same ones. I think GameFools is great. It has different games. I get so tired of the mystery games. I like games played for relaxation and not suspense. I'll be picking more games up in the future. The games are quite intriguing. It does keep your eyes open and your brain in action. The puzzles are not as easy as you would think. They are a fun challenge, so remember to keep your brain in overdrive. You will be happy you played these challenges. This game is even better than the original Clutter. We love the various versions of the messes that the author has created, and the mini-games are very challenging. This is a fun game, and if you do not make it to the end, you can repeat without losing additional points. Love it! Loved this game -- gets faster as it goes on. Not to good with my hands so it's an ideal game for me.